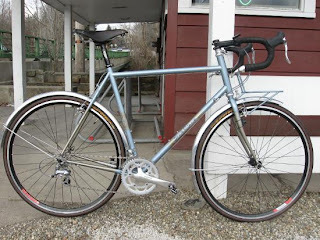 We had the privilege of custom-building this 2011 Salsa Casseroll for a customer in our Peninsula store. This bike is replacing a custom Serotta, and the rider will be using it for brevets and other endurance events. You can see more photos of the bike, as well as the full specifications, on this page in our Bike Gallery. Check out other custom bike builds and modifications we've done in the past in the full Bike Gallery. This bike is absolutely stunning. The hammered fenders brought it all together.